Does your server vendor matter anymore? Nice machine! But since I'm not a big fan (to say the least) of Windows 8.1, I decided to take the plunge and try upgrading the machine to Windows 10 even though I personally feel Windows 10 isn't quite ready for prime time yet and even though the laptop would also be one of my main work machines (which meant it needed to work). Run Windows Update to fully patch Windows 8.1. Update the laptop's BIOS if needed. Update the device drivers if needed. Use the HP System Recovery utility to create a USB Recovery Drive. Perform the operating system upgrade from Windows 8.1 to Windows 10. Check whether Windows 10 activation has been successful. Run Windows Update to fully patch Windows 10. Update the laptop's BIOS again if needed. Update the device drivers again if needed. Right off the bat the first step in this process threw me for a curve--Windows Update showed that there were over 150 updates (totaling more than 2 GB!) that had to be downloaded and installed on the machine--yikes! Needless to say updating Windows 8.1 took several hours and involved multiple reboots, and when dinnertime arrived I still had a couple of final updates that were waiting to be installed. The moral here is clearly not to begin a system upgrade on a Friday afternoon. Support technician: Hello, how can I help you? Support technician: Certainly, I can help you with that. What is your product number? Support technician: That's not correct. Me: But when I press the FN + ESC keys the HP System Info window opens and that's what it shows there. Support technician: That's not correct. Please do <complex series of steps> and let me know the result. Support technician: Thanks. OK how can I help you? Support technician: Can I please have your permission to take control of your system? Support technician: So I can perform the BIOS upgrade for you. Me: Uhhh, no. If something goes wrong my system will be bricked. I'd prefer to flash the BIOS myself by following the instructions on your website. Support technician: OK how can I help you? Support technician: I can help you with that. Can I have your permission to take control of your system? Me: OK it looks like <string> is the latest BIOS that is available for this machine, is that correct? Support technician: I can install the new BIOS version on your system if you like. Support technician: I'd be happy to upgrade the BIOS for you. Support technician: OK...can we consider this support session completed? By this time I was feeling somewhat stressed over the support technician's constant insistence on trying to help, so I decided to head off to bed and finish the upgrade on Saturday. Upgraded machine to latest BIOS version--success! Upgraded one device driver using HP Support Assistant utility--no problem. Uninstall MacAfee and other preinstalled software that I didn't want or need on my machine--done. Need next to create an HP USB Recovery Drive in case things go south upgrading to Windows 10. Rats, no spare 32 GB flash drive in my drawer. Ran down to Circuit City and bought one from an overly-helpful sales associate who pointed out to me that the one I had chosen was three times the price of the el cheapo ones in the fishbowl beside the cash register. Thank you! OK now it's time to upgrade the operating system from Windows 8.1 to Windows 10. Opened Windows Update and found Upgrade To Windows 10 displayed so clicked Get Started to start downloading the update for Windows 10. I knew this would take awhile so I attended a scheduled meeting. When I came back from the meeting I checked Windows Update and it said the update was installing, so I went out for a coffee. Update your antivirus software and the antivirus definitions before upgrading to Windows 10. Set the antivirus application to update automatically. Go to the antivirus software manufacturer website for more information. I wondered if perhaps I should have disabled the antivirus program on my machine before attempting the upgrade? So I turned off Windows Defender and then opened Windows Update, selected Upgrade To Windows 10 and clicked Get Started once again. This caused my machine to begin downloading Windows 10 all over again (sigh) so this time I put the laptop on my desk so I could keep an eye on it while I did some work on my desktop machine. After a long time the download completed and the update for Windows 10 began to install. This time when the machine rebooted it displayed the message asking whether I wanted to get the upgrade started, so I clicked Accept and the operating system upgrade went smoothly from that point forward--except that it took over an hour. When the upgrade finished I logged on, clicked the Start button and gazed in awestruck wonder at the new Windows 10 start menu. By this time I had had more than enough for one day so I decided to postpone the final steps until Sunday. On Sunday afternoon I opened my laptop, logged on and verified that Windows 10 had successfully activated. I then ran Windows Update and installed several pending software updates for the new operating system. Then I opened the HP Support Assistant utility and checked for HP software updates. I discovered there were eight HP software updates needed which included a newer BIOS version, five updated device drivers, and two updated versions of HP software programs. Sigh. I decided I had better install these one by one in case any of them caused more problems than they fixed for my particular make and model of laptop. So I started with the BIOS update and used the HP Support Assistant to flash the BIOS. When I had booted up to Windows 10 again, I thought maybe I ought to run the HP Support Assistant one more time in case the new BIOS required additional HP software updates. Strangely, this time the HP Support Assistant showed that there were NO more software updates available from HP. So I guess the older BIOS was triggering "false positives" about there being newer device drivers available for Windows 10. Anyways, that was a relief, so I spent about 15 minutes testing various functionality including sound, display, sleep, etc and everything seemed OK. So finally I was done. It only took me 3 days to upgrade my new laptop to Windows 10. I'm sure the technicians at the store where I bought it could probably have done it faster, but then I would have missed out on all the fun. While the bulk of the above story is about upgrading to Windows 10, I do want to give a small word of advice to any support technicians out there who may be reading this issue of WServerNews. My advice is this: don't try too hard to help. The laptop, PC or server you've been asked to provide assistance with is the customer's, not yours. Let the customer determine the pace of the support session, not you. And if any of our readers have any advice of their own that they'd like to offer to support technicians, feel free to email me at [email protected] and we'll share it in the Mailbag of a future issue of this newsletter. Customer at a catering company (small business, 15 employees, 1 office computer, 1 laptop) wanted to upgrade to w10 pro. Verified that everything was working OK before the upgrade, performed backup. Upgrade went well but…..
Office 2010 now not opening documents saved and therefore new documents are having to be re-created. All the documents are written and saved in Office and opened fine before the upgrade. With over 100 customers, recreating documents is not easy and there is no previous visible document to use as a reference because office 2010 won't open them. Not all documents are affected just about 30%. Copied the documents from the backup and all the documents open on W7 with office 2010 (used another computer) but not in W10 with office 2010. Tried repairing Office, look up this issue on the internet, seems to be fairly common with no solution. It really bites. I noticed that you have to open the Office application and navigate to the document so that it can be opened from within the application. In my case I had both Office 2007 and 2010 installed in tandem on the system. I had assumed that the issues were the result of the document extension not being registered. Since this is a "test" system… I hadn't thought much about it - until I read [Sam's] article. My installation of W10 was an upgrade of a W7 Pro system. The old system had two versions of Office installed. After the upgrade, I could click on a document and it would launch a version of Office... but the document was blank - just as if I were creating a fresh document. However, I discovered that I could browse for a document from within (say Word) and could open the document without any issues. I could use either File -> Open or click into "Recent Documents" within Word and it would successfully open the desired document. Keep in mind that this was an Microsoft Action Pack set-up... which has a slightly different licensing scheme. I wanted to solicit feedback from readers whether they have seen any issues with migrating Windows 7 profiles to Windows 10. I believe that after logging into a Windows 10 system for the first time with a user who has a roaming Windows 7 profile with a .v2 extension, Windows 10 should create a new profile with a .v5 extension, and all of the user's profile settings (application settings, favorites, wallpaper, etc.) except for Start Menu customizations should carry over. But that is not happening. In one case, a new roaming profile was created, but no settings were migrated, and in another, the profile folder with a .v5 extension was created, but the user's settings were neither loaded onto the Windows 10 machine (it stated there was an error and loaded a temporary profile), nor written back into the roaming profile folder. Had similar issues with the .V2 folder name not renaming to .V5. Figured out the it actually does a rename due to a few admin user that had addition rights and the roaming profile folder renamed properly without intervention from .V2 to .V5, other normal domain users failed to get roaming profile and got a TEMP profile. Simple solution was to manually rename the .V2 profile folder to .V5 and all is well for the normal domain users. Guessing you could also tweek the profile folder creds to allow the domain user to rename. Your list of how various Windows machines will respond to the W10 upgrade is certainly helpful. Do you have any information/comments on installing W10 on a MacBook Pro running Dual Boot, now running under Windows 7? Unfortunately for me - unless I choose to use something like Parallels or similar, my Mac Pro (the big silver monster) will not run Bootcamp w/Windows 10. Before I did the upgrades to Window 10 I cleaned up all computers with Glary Utilities, Cleanup, and Malawarebytes programs. Then I did backup to an external HD. Things such as, contacts, messages, pictures, video's, Documents, etc. Had no real trouble with all the Win 10 updates, went quite seamlessly. Only snag I have encountered so far that I am aware of is the following. On the Win 7 Ultimate SATA HD I had a separate partition with around 23GB of the data above which I had saved to the external HD. Win10 seemed to have wiped that off the partition, but was able to put back on the now main HD, from the external HD. All I can say from my experience of Windows 10 Upgrade is by far the best yet. As with any new System it takes a little of figuring out were some things are, i.e. new set up with the control panel, a few things renamed. But, that's progress one just has to go with the flow. No hesitation at this stage to recommend to other. I uploaded Windows 10 and lost 20 years of Outlook Express contacts and files. I now cannot use my Deskjet printer. It has not been a good two weeks. I did not know that I had to do this. I was invited to upgrade and I think the pitfalls and problems should have been mentioned as this has caused such awful problems. I told her that I didn't know whether this would also restore the contacts and files she had lost but at least she would probably be able to print again. I have a couple of machines on Windows 10 Insider Program and one updates with no issue, the other is having a problem with the latest TH2 release. This won't install and fails during the file copy process, this in itself is not a particular issue, what is though is that every time it fails to install it deletes the downloaded 3.5GB files and then downloads them again to retry the install, only to fail and continuously repeat the cycle. I have an unlimited internet connection so no biggie other than the time taken, but those on a metered connection may find themselves with a big bill if this process is repeated on numerous occasions. The wide reaching (zero) privacy statement and inability to easily manage privacy settings presents a barrier for me to deploy an otherwise good release. I am basically waiting for a fix that makes it easy for me to proceed… but I wonder what this portends for the next server releases. I am very concerned about data privacy when data systems used to drive business intelligence are housed externally and privacy statements are just linked documents which can be changed on the fly without any substantive notification. I happen to be one of those who actually read (on occasion) license agreements and it is astounding what is incorporated. I have one vendor who stipulates that by installing their product that we provide unspecified power of attorney, full access to our company personnel as well as unrestricted access to our data. Of course… they better bring a subpoena to make good on most of that still… this same company wants me to route our data through their cloud. I thought Microsoft had more sense. Personally I think the whole world has gone crazy and has their head in the cloud. I think Toshiba left out many systems that might be compatible. For example my T135D-S1324 is not on the list and yet the upgrade seems to have worked completely. No systems of this form are listed at all. Perhaps they did not want to test this system or other consumer oriented systems. My guess is that these pages keep getting updated as the manufacturer expands their test matrix. My media center is an eEbox PC from Asus. It runs an Atom processor, and whilst it runs Windows 7 fine (not the fastest machine, but it does nicely for media), it has managed to get the windows 10 update notification. Here is the problem: every time it is turned on, it pops up the nag screen to upgrade to Windows 10. I have tried it a couple of times, with the same result -- "Your machine will not run Windows 10, sorry!" How do I now get rid of that nagging Windows 10 upgrade screen? I am happy to leave it to run Windows 7, but I am really surprised that Windows 10 will not run on the machine -- it complies with the minimum requirements on Microsoft's page! This policy setting can be found under Computer Configuration \ Administrative Templates \ Windows Components \ Windows Update and you can enable it by opening your Local Computer Policy by running gpedit.msc on your machine. Updates are cumulative, with each update built upon all of the updates that preceded it. A device needs to install the latest update to remain supported. Updates may include new features, fixes (security and/or non-security), or a combination of both. Not all features in an update will work on all devices. A device may not be able to receive updates if the device hardware is incompatible, lacking current drivers, or otherwise outside of the Original Equipment Manufacturer’s (“OEM”) support period. Update availability may vary, for example by country, region, network connectivity, mobile operator (e.g., for cellular-capable devices), or hardware capabilities (including, e.g., free disk space). We interpret this as meaning you'll need to keep applying the latest "versions" or "releases" of Windows 10 to your PCs if you want them to remain supported by Microsoft, but the wording seems somewhat vague so perhaps Microsoft themselves haven't quite figured out their plan yet concerning future versions/releases of Windows. 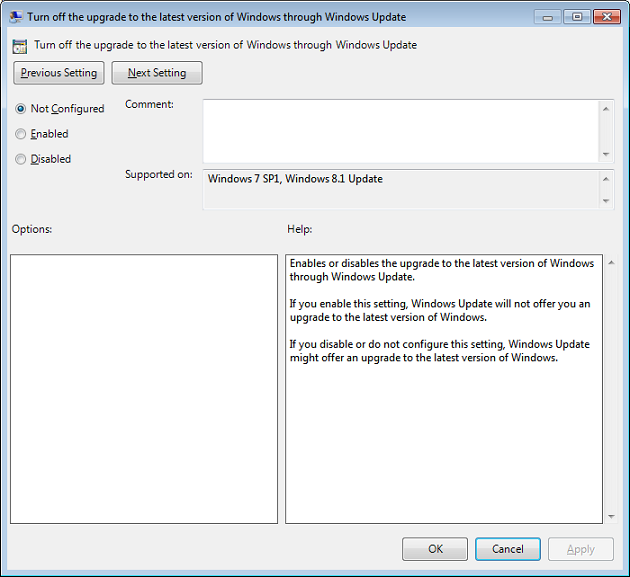 The version of MDT 2013 Update 1 released at that time was build 8290. However, if you read the comments for this blog post it looks like there are still some issues that may need to be resolved so you may want to wait for MDT 2013 Update 1 to be re-re-released before attempting to use it to deploy Windows 10 or build Windows 10 images in a production environment. To us this seems like just one more sign that Microsoft has been pushing out their next version of Windows 10 too fast before it's ready for use in the business world. Readers who are especially interested in any of these new features can reach out to us at [email protected] and we'll try and dig up some more info about them for future issues of this newsletter. Between now and October 15, 2015, take the Know it. Prove it. Challenge, and you could win an all-expenses-paid trip to Seattle and a backstage pass to Microsoft! Enhance your tech skills on Windows 10 for a chance to win. Find out more, and get started today! "You wouldn't have one if we'd beaten you." The SharePoint 2013 Search Query Tool lets you test out and debug search queries against the SharePoint 2013 Search REST API. FTP Probe creates a fully indexed html output of all the files available for download from an FTP server. As cloud service costs drop, and features and capabilities improve, competition among cloud providers becomes fierce. Unfortunately, many IT organizations unknowingly go "all in" with a single cloud provider instead of keeping their competitive options open. Learn how to detect cloud vendor lock-in before it's too late. Many organizations still value brand name servers, but, in today’s world of hardware abstraction, do you really need a brand name server for virtualization? Find out why you might be missing out if you remain dedicated to the name brand servers, instead of going an alternative route. Securing VDI against malware is not only complicated, but also just as critical as it is in traditional desktop environments. Don't underestimate the security hazards associated with desktop virtualization – learn how to protect all aspects of your VDI environment against malware today. The end of support for Windows 2003 spurred a lot of admins to make the move to a virtualized environment, since virtualizing your OS in vSphere offers several key advantages. Learn more about how VMware vCenter Converter can add longevity to legacy OSes.